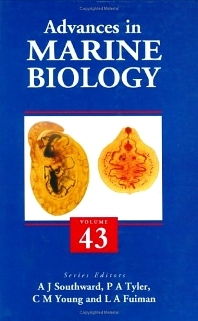 Volume 43 is an eclectic volume with reviews on ecology and biogeography of marine parasites; fecundity: characteristics and role in life-history strategies of marine invertebrates; the ecology of Southern Ocean Pack-ice; and biological and remote sensing perspectives of pigmentation in coral reef organisms. Advances in Marine Biology was first published in 1963. Now edited by A.J. Southward (Marine Biological Association, UK), P.A. Tyler (Southampton Oceanography Association, UK), C.M. Young (Harbor Branch Oceanographic Institution, USA) and L.A. Fuiman (University of Texas, USA), the serial publishes in-depth and up-to-date reviews on a wide range of topics which will appeal to postgraduates and researchers in marine biology, fisheries science, ecology, zoology, oceanography. Eclectic volumes in the series are supplemented by thematic volumes on such topics as The Biology of Calanoid Copepods. Marine Biological Association, Plymouth, U.K.
Craig Young is Professor of Biology, and Director of the Oregon Institute of Marine Biology. Dr. Young has devoted his professional research career to investigating the early life-history stages of marine benthic invertebrates, from the ocean surface to deep-sea environments worldwide. He is a leading authority with extensive experience investigating, describing and teaching the biology, ecology, behavior and morphology of marine invertebrate larval forms. Dr. Young returns to the second edition of Atlas of Marine Invertebrate Larvae to continue to lend his expertise and knowledge as a co-editor. Oregon Institute of Marine Biology, U.S.A.
University of Texas at Austin, Port Aransas, U.S.A.